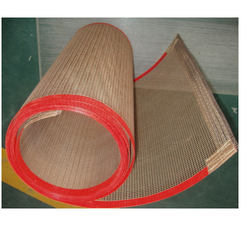 Our PTFE Coated Mesh Belt is widely used for drying of screen Printed and dyed textiles at higher speed and higher temperature.It provide a high percentage of open surface area, creating maximum airflow and sufficient operation with minimum heat loss. Width and length stability of the belts are retain over full range of operating temperature. Oiling machine for paper glazing and waxing, plant engineering. 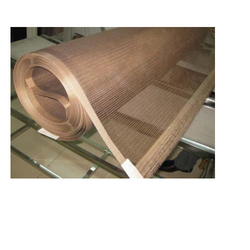 Seperating sheet for hardboard production etc. Our organization are a trusted name engaged in offering an unbeatable range of PTFE Teflon Mesh Belt to the clients. These products are designed and manufactured by our experts using high quality raw material and sophisticated technologies at our state-of-the-art infrastructure. Our organization is standing in the league of leading firms that are offering PTFE Teflon Button Belts. Manufactured and designed as per the customers specifications and requirements at our capacious infrastructure. All these products are developed in different specifications to suit the varied needs of our valued customers. Looking for PTFE Belt ?